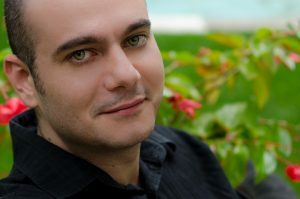 Driven by emotion, beauty and spirituality, and inspired by the worlds of nature and literature, Constantine Caravassilis’ evocative music is intimately connected to his Hellenic roots, often drawing inspiration from ancient Greek mythology and Byzantine chant. Born in Toronto to a family of musicians, Constantine was raised in a culturally rich community on Samos Island, Greece, the birthplace of the great 6th century B.C. mathematician and philosopher, Pythagoras. Taking his first violin lesson at age six, he soon switched to the piano and then founded his own orchestra and choir at age 15, giving annual concerts at the local lyceum. Constantine is also an active pianist and conductor based in Toronto, which has been his home since his late teens. He has conducted the gamUT chamber orchestra at the University of Toronto, Opera5, Concert:Nova, and a number of university-based ensembles, and has recorded and premiered works by some 25 young Canadian composers to date. Since his mid-twenties, and while still a student, he has enjoyed international exposure through more than 350 performances of his music in more than 20 countries and in important venues including Carnegie Hall (New York), Jordan Hall (Boston), Southam Hall (Ottawa), Bunka Kaikan Hall (Tokyo), Alte Oper (Frankfurt), Round Tower (Copenhagen), Smolensk Philharmonic Hall (Russia) and the Athens Concert Hall, to name but a few. In 2006, his work Baroque Revisited, incidental music written for a documentary of J. S. Bach’s Goldberg Variations, was toured in 43 States in America. Additionally, his music has been streamed by countless internet-based outlets and broadcast by BBC3 in Britain, CBC Radio in Canada, CNN Turk in Turkey, TDK Radio in Japan, WCRB Radio in the United States, The Hellenic Broadcasting Corporation, CJCW Radio in Calgary and CKCU Radio in Ottawa, National Radio of Mexico and CFCR in Saskatoon. WQXR (New York Public Radio) has broadcast Constantine’s music more than 60 times in the past year alone. His music has been featured in many prestigious festivals across the world, including the Zagreb Biennale and the Ottawa International Music Festival. In 2010, Constantine was named finalist for the Royal Bank of Canada Emerging Artist Award, in addition to winning a number of top honours including the Karen Kieser Prize in Canadian Music and the Harry Freedman Recording Award. In 2006, he was declared Grand Winner of the Volos City International Composition Competition (Greece), where he was awarded three gold medals for his profoundly mature style and highly individual compositional voice. Jazz & Tzaz music magazine hailed him as the most important Hellenic-descent composer of his generation. He has also held composition residencies with the London Song Festival (UK), the Open Strings Festival (Denmark), the Contemporary Opera Lab (Winnipeg) and the Harps on the Hill Festival (Richmond Hill, ON). In 2013, Constantine was guest composer/conductor with Concert:Nova in Cincinnati, where he led the ensemble in the world premiere of his song cycle Proses Lyriques, featuring superstar male soprano Michael Maniaci. In March of 2015 he was Composer-in-Residence at the National Conservatory of Music and Dance in Monterrey, Mexico and Visiting Artist in Composition with the Faculty of Music, University of Nuevo Leon. His music has been performed by the Camerata Orchestra in Athens, the Winnipeg Symphony Orchestra, the Orchestra of the North Shore in Vancouver, the OCFAMUS orchestra (Mexico), the Composer’s Orchestra in Toronto, L’Orchestre de la Francophonie in Ottawa, the LesAmis Ensemble, the Penderecki String Quartet (Canada), the Caravassilis String Quartet (France), the Cromano String Quartet (Mexico) Duo Volando, the University of Toronto and the University of Manitoba Symphony Orchestras, the gamUT ensemble and the Gryphon Trio, among many others. In January 2013, the Canadian Music Centre released Constantine’s first double CD album Visions with 112 minutes of solo piano music written in his mid-twenties (The Complete Books of Rhapsodies and Fantasias) on the Centerdiscs label. Recorded by internationally acclaimed pianist Christina Petrowska Quilico and CBC senior producer David Jaeger, Visions reached great critical acclaim worldwide with some twenty highly favourable reviews, and within weeks after its release, it reached No.1 in the CJCW New Music charts and became a Top Seller in online sales for CD Universe. Visions is now distributed internationally by Naxos Direct, and will receive its first tour in Greece in the fall of 2017. Recent and upcoming projects include Silver Angel, a new bassoon concerto for Thirteen Strings (Ottawa) and Canada’s premiere bassoonist Nadina Mackie Jackson, a new orchestral work commissioned by the Academica Orchestra in Athens, Greece and two new song cycles commissioned by early music singer Josee Vailancourt and countertenor Michael Maniaci. Slated for premiere in the 2017-2018 season is also a new extended work commissioned by Ukrainian pianist Vadym Kholodenko, gold medalist of the famed Van Cliburn International Piano Competition. Constantine is affected by a rare case of synaesthesia and his works influenced by his condition are regarded by critics and audiences alike as contemporary masterpieces. He has delivered a number of lectures on the condition as well as several related subjects at a number of institutions among which are Nuevo Leon University, the American Synaesthesia Association, the Universities of Calgary, Toronto, York and Manitoba, OCAD University and the Ontario Art Gallery. Educational highlights include studying piano, conducting and composition at the Royal Conservatory of Music, the Marcel A. Desautels Faculty of Music (University of Manitoba), and the University of Toronto in both the undergraduate and doctoral levels, as a pupil of some of Canada’s finest musicians. Among his most influential teachers are Christos Hatzis (composition), Raffi Armenian (conducting) and Christina Petrowska Quilico (piano). Constantine was the only composer to develop a mentoring relationship with pioneering Canadian composer Ann Southam prior her death in 2011, and credits her for encouraging him toward absolute freedom of expression when in the creative process of composing. In addition to several academic scholarships, he has received a number of commissioning and recording grants by the Toronto, Ontario and Canada and Arts Councils, the British Arts Council and the Winnipeg Arts Council, and has been provided with professional training by a number of institutions including the Toronto Summer Music Academy, the National Arts Centre, City Opera Vancouver, SoundStreams Canada and the Winnipeg Symphony Orchestra. Constantine is grateful to have benefitted through tête-à-tête training by a large list of award-winning composers which includes John Corigliano, George Tsontakis, Osvaldo Golijov, Chou Wen Chung, Anders Hillborg, David Maslanka, Jennifer Higdon, R. Murray Shaffer and Cornelius Schwer. His catalogue of works is published and handled exclusively by Pythagorean Editions.